Laser metal deposition (LMD) is an additive production process that uses a laser beam to form a pool of melted metal (a melt pool) on the surface of a metallic substrate into which metal powder is injected using a gas stream. The absorbed metal powder produces a deposit on the surface. Typical applications include the repair of metallic components, such as mold tools, valves, worm screws. laser cladding and additive manufacturing are other names for the process. LMD is replacing many traditional manufacturing processes such as gas metal arc welding and thermal spraying. A nozzle or multiple nozzles blow the powder into the process zone. 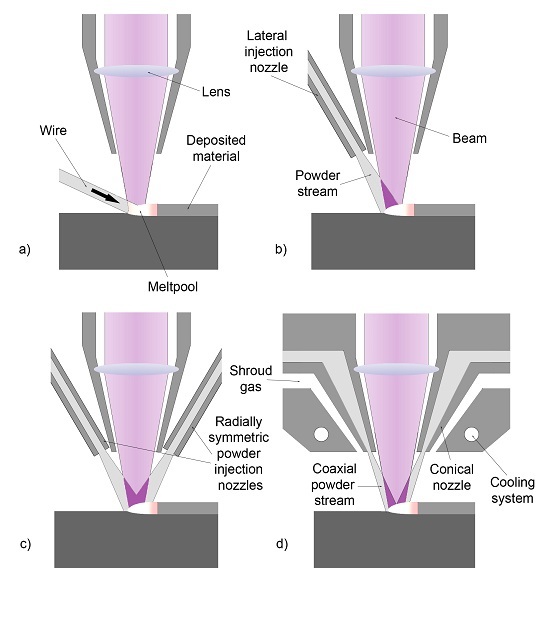 The laser and powder interact, preheating the particles to below their melting point and the preheated particles are absorbed into the laser-induced melt pool. Usually, the laser beam and powder nozzles are moved in the Z direction while the part being worked on is moved in the X-Y plane under computer control to achieve the required cross-sectional geometry of the deposit. Multiple layers are built up one by one to create the three-dimensional component. Using this process complex geometries with high dimensional accuracy can be produced. LMD is used in a wide range of industries that require the production and repair of bespoke and high-value parts. Amongst other applications, the technology is now well established for the deposition of vanadium carbide tool steels, medium carbon steels, and titanium alloys. Industrial sectors include offshore, oil and gas, power generation, utilities, automotive and aerospace. An essential advantage of LMD over methods such as tungsten inert gas welding is the relatively low heat that is applied. The high level of control over the laser means that exact amounts of energy can be applied to the highly defined regions of the substrate. This process creates much less distortion and heat damage to the part. Additionally, an improved microstructure can be achieved. As the laser beam is stable and easily adjusted, the process is highly reproducible leading to much higher reliability. Process automation is also more straightforward, and material build-up rates are high, leading to faster processing speeds. We describe some of the more advanced applications below. Different powders can be premixed before injection or several different powders from multiple containers can be used to create a custom alloy. Additionally, by combining different metals and alloys, sandwich structures can be produced. Material combinations that are difficult to achieve with traditional methods can be generated with LMD and include titanium-tantalum, iron-tantalum, and iron copper. Forming dies, used in automotive production, are subject to enormous strain and wear rapidly. They require regular maintenance and frequent replacement. With even small dies costing thousands of euros, this becomes an expensive overhead. LMD can be used to coat these stainless steel die in critical areas that are subject to the highest forces, substantially increasing die lifetimes. A recent advance is in situ LMD die re-coating which can increase die lifetime by up to 150%. While LMD technology development dates back to the 1970s, it was many years before the process emerged from the laboratory. Some of the reasons for industry’s reluctance to adopt it included its cost and unreliability due to the large number of variables involved in the process and the difficulty controlling them. Even today it is considered an emergent technology, but one that increasing numbers of organisations are adopting. In its early days, it was usual to use a CO2 laser, but the latest developments use fiber lasers which are far more controllable, reliable and consistent. As a result, experts are now predicting that laser metal deposition and additive manufacturing will grow at over 30% a year; that it will be integrated into 10% of industrial applications, and will reduce new product time to market by up to 25%. Fiber lasers are playing a significant role in the rollout of LMD. As we have shown, many major manufacturing industrial sectors are now adopting this highly complex manufacturing process. To find out more about how fiber lasers are impacting on the industry, contact SPI lasers for more information.